Omega-3: why flax oil is better than krill oil Flax Farm | Linseed Oil for your well-being. In the oceans there is a little shrimp-like creature called krill. It exists in huge numbers. Naturally krill is one of the first rungs of the food chain and is eaten by everything from the small fish to whales. It happens krill is a rich source of protein and omega-3, which is why people are hoovering it up wholesale and putting it into supplements and to feed for farmed fish. Years ago sand eels were harvested almost to depletion from the British coast waters. This left many sea birds, including the lovely puffins and their young to starve. 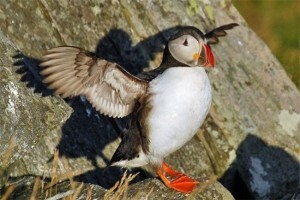 Sadly populations of puffins have never recovered. The krill harvest is not sustainable, the day we notice the effect on whales and other marine life it may well be too late for many species. We don’t need to take fish or krill from the oceans for omega-3. Linseed oil is a sustainable environmentally friendly alternative source of omega-3 to fish and krill oil. Fish and krill oil goes rancid and stinky very easily so goes through many processes to chemical and mechanical processes “clean” it this can strip nutrients from the oil and damage the omega-3. Flax Farm Linseed Oil is cold-pressed fresh from the seed. The oil is fresh and sweet and the omega-3 is in pristine condition. Using Krill Oil/Fish oil a supplements doesn’t do anything to improve the underlying diet. Linseed oil doesn’t have to be used as supplements, it can simply be used as a food that improves the dietary omega 3 balance which removes the need to take supplements. Krill harvesting could starve many marine creatures, farming linseed provides a natural farmland environment which is is rich in wildlife. To get omega-3 needs you can buy Flax Farm Cold-Pressed Linseed Oil, UK-harvested, it tastes great, it is good for you and the environment! This entry was posted in Blog, Farming, Health, Natural history, References, Uncategorized and tagged DHA, EPA, fish oil, Krill oil, omega-3 for health, sustainable, the environment, Whales.